I’m really excited to let you know that my image: “Photon Worshippers” featuring sunset along the rugged Pacific Coast in Big Sur, California was named winner of the Royal Observatory’s 2010 photo competition in the category People and Space. For details see the competition’s Winners page. A two man film crew from Buzz Films, Ltd, London flew out to interview me two weeks ago and was tasked with creating a 90 second piece about my work. 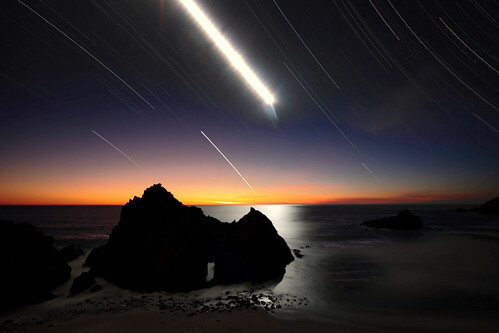 I thought they did a great job capturing my passion for astro and startrail photography! This is the winning photo. Photographers gather at the opening of an enormous rock in the Pacific Ocean in Big Sur. The setting sun shines directly through the opening only a few weeks of the year. The photo and interview will be exhibited in the Royal Observatory, Greenwich, England until February, 2011 along with the video. Admission is free. Please email me if you visit the exhibit and let me know what you think. I hope to get there later in the year. in a Science Section of the UK Times (only available via subscription). By the way if you’re interested in taking pictures of the night sky, you may want to join Harold Davis and me for our Alabama Hills Star Circle Workshop in November. One of the reasons I went to this location was also to get a star trail. These are the results of those efforts – the bright slash is the setting crescent moon. This entry was posted in Announcement, Contest, Image, Travel and tagged APotY, Astronomy Photographer of the Year, contest, Greenwich, Royal Observatory, winner on September 9, 2010 by Steven Christenson.